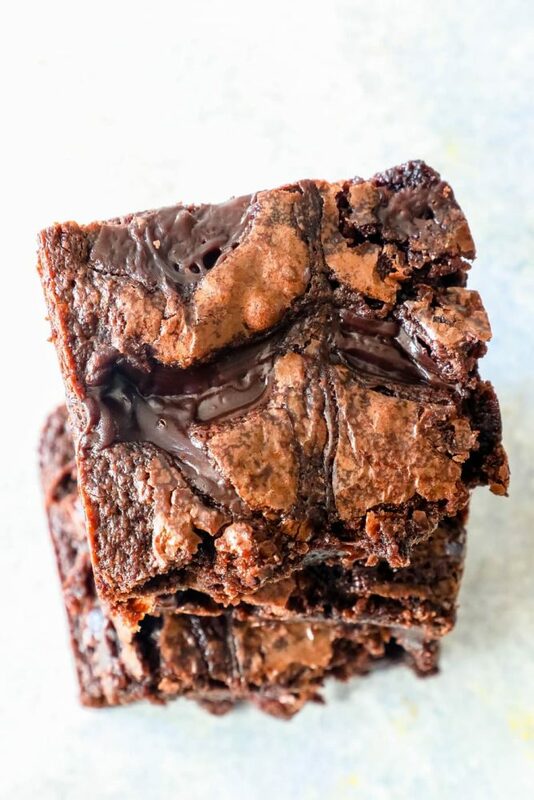 The Best Fudge Brownies Recipe – super simple, delicious, and easy double fudge brownies with tons of gooey hot fudge in every bite! 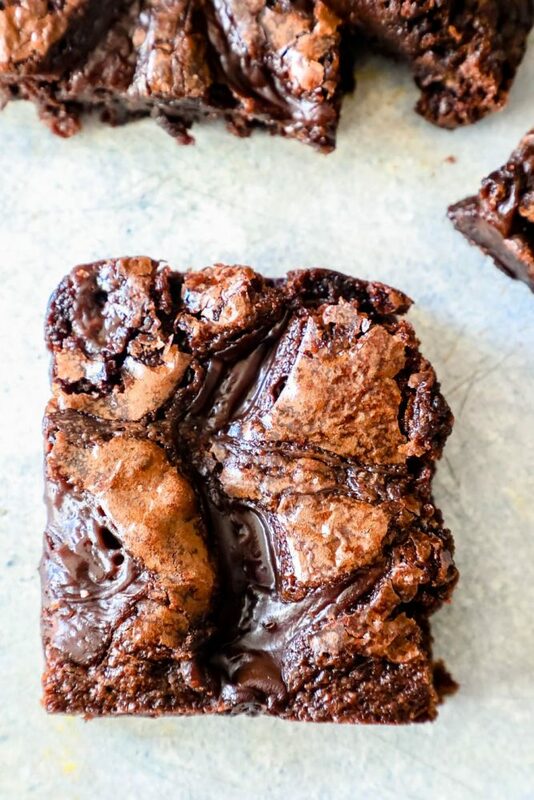 These fudgy brownies are one of my absolute favorite desserts, ever. They are ooey, gooey, chocolatey, and are showstoppingly beautiful – they make for an amazing dessert and are crazy easy! 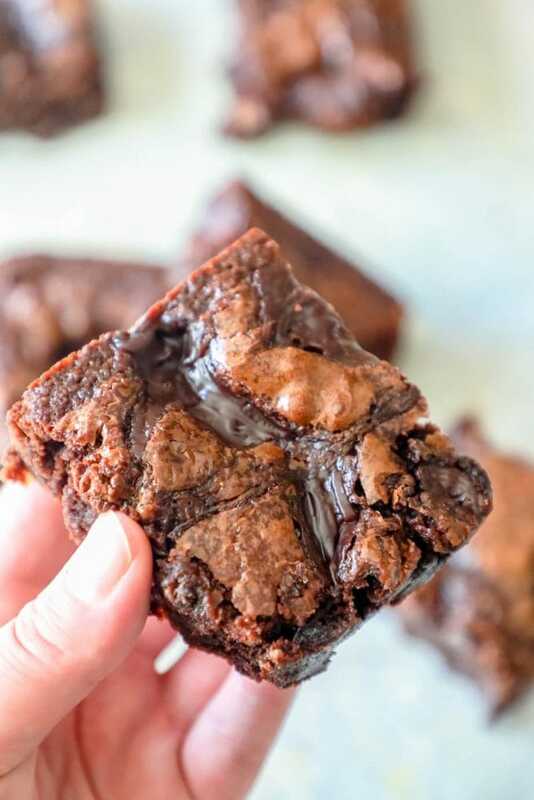 If you love rich, delicious hot fudge – and you love brownies with a perfect gooey texture – this recipe for The Best Fudge Brownies Ever are going to be your next go-to when the craving for chocolate hits! If you love these deliciously easy fudgy cocoa brownies and want to get straight to the recipe and skip over my helpful tips and tricks, please scroll to the bottom of the page, just above the comments. I get a lot of questions and requests for similar recipes on my posts, so I try to add a lot of information to them! 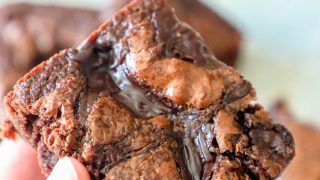 Thick, gooey, and fugdy brownies can be a pain to cut – but there are a couple easy tips to making your fudgy brownies a snap to cut. -Let cool completely to set brownies. -Clean knife in between cuts. -Slightly chilled fudgy brownies cut more cleanly. -For best results, melt the butter and melt the chocolate in a double boiler instead of in the microwave. -Be sure to preheat oven to 350 before adding brownies to oven. 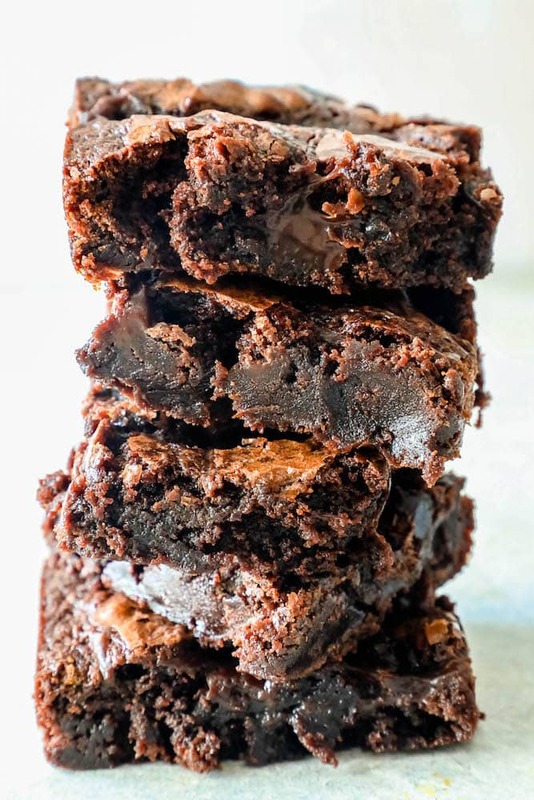 -Bake for 30 minutes and check brownies – they might take up to 40 minutes, but I find it is best to check since ovens and ingredients can very wildly. -Make sure you use a well prepared pan before adding brownie batter. -Let cool completely before slicing or removing from pan – this will help it come out clean. Perfect gooey brownies are indulgent and delicious – with crunchy edges, a soft middle that melts in your mouth, and tons of fudge flavor. Fudgy brownies are less like cake, and more like fudge – hence the name – and have a much thicker, more dense feeling. 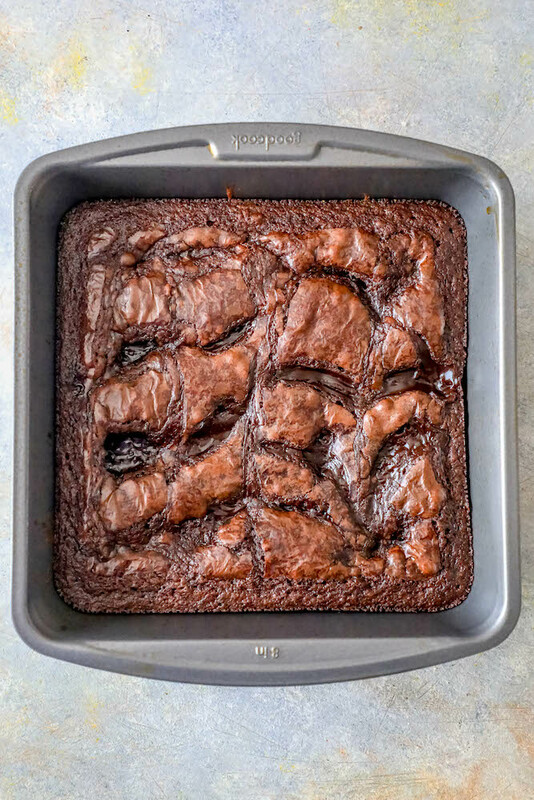 Fudgy brownies almost seem uncooked (though they are not at all) – thanks to a heaping serving of fudge swirled on the top that sinks down into the brownies and makes it extra delicious. 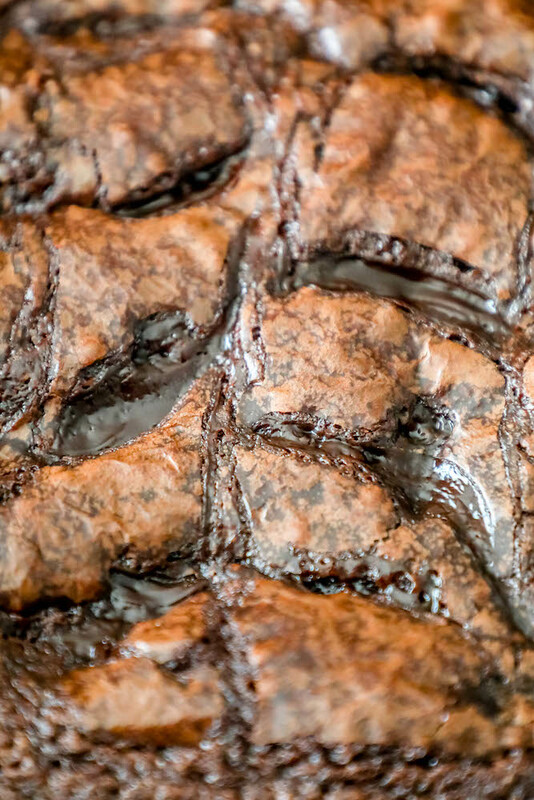 To make sure your brownies have a gooey texture when well cooked, there are a couple tips to follow to ensure perfectly delicious moist and fudgy brownies. Don’t rely on the toothpick method. Since we’re swirling hot fudge over the top of the recipe, the toothpick will come out with fudge on it if inserted into the brownies through the hot fudge. Look for a crunchy crust that has slightly pulled away from the pan to be sure your brownies are cooked through. A well preheated oven will cook brownies more evenly – adding brownies to the oven before it is the right temperature can make brownies cook unevenly. While batter should be mixed well, don’t overwork it, which will make brownies tougher. If you’re looking for delicious, decadent, and indulgent brownies that you can make in a big batch and portion out – or looking to save brownies for later, I’m sharing tons of tips and tricks for how to freeze brownies! Prepare your brownie recipe as called for below. After brownies have set in pan for 10 minutes, transfer to wire rack and let cool completely. Using a large serrated knife, cut brownies into individual sizes. Wrap individual brownies in plastic wrap or heavy-duty aluminum foil. Roll or fold the foil or plastic wrap tightly around the brownies, but don’t smush them. Place individually wrapped brownies in a plastic bag and remove any extra air from bag to help prevent freezer burn. Keep in freezer for no longer than four months, let defrost naturally in refrigerator overnight. If you love these delicious fudgy brownies, you’ll love these other delicious desserts! Please click the links to find each easy and delicious dessert. If you love the best fudge brownies recipe as much as I do, please give it a five star review and help me share on facebook and pinterest! 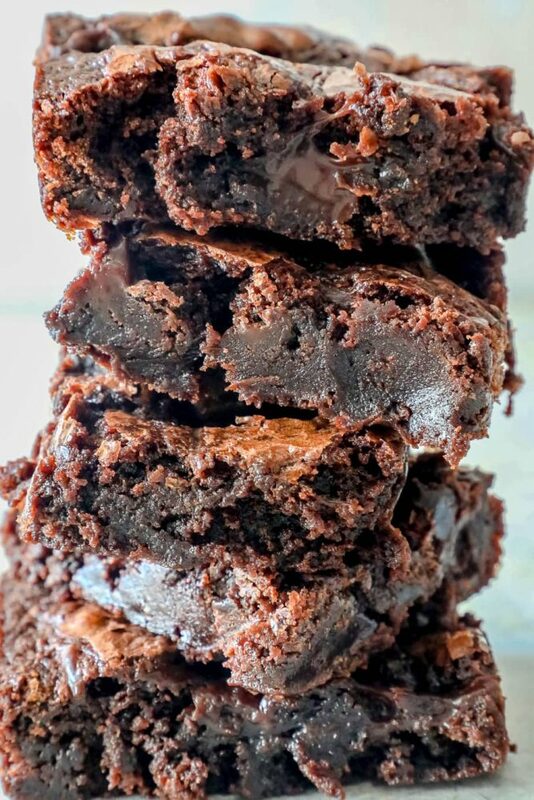 The Best Fudge Brownies Recipe - super simple, delicious, and easy double fudge brownies with tons of gooey hot fudge in every bite! Lightly grease 9x9 pan with cooking spray or butter. In a large bowl, combine sugar and butter and mix until soft. Add vanilla and eggs, and mix thoroughly. Fold in flour and cocoa, mix well but do not overmix. Mix in 2 tbsp lightly warmed hot fudge. Spread rest of the hot fudge across top of brownies - I make 3 long lines, then drag a spoon back and forth over the top of the brownies to make a design in the fudge. Bake until sides of brownies are crunchy and have slightly pulled away from the pan. Toothpick inserted in middle might not come out clean because of the hot fudge swirled on top, but if you can avoid the fudge, toothpick in middle should come out clean.